I once believed the best way to become a good runner was to do a lot of running. I’ve discovered that’s only part of the equation. When I started running in 2007 I was under the mistaken impression that to get good at it I just needed to run a lot. My kids and I decided to run the annual Thanksgiving Day Turkey Trot in downtown Detroit. I trained hard. Really hard. I worked up to three miles in a matter of weeks and was very proud of myself. Just to be sure I could run the race and run it well, the day before I ran three miles as fast as I could around an indoor track. On Thursday I was sore. Really sore. I managed to finish the race, but only because I am stubborn and have a high tolerance for pain. My pace was so slow that to this day that race is my personal record for the slowest 5K without pushing a grandchild in a jogging stroller. The lesson I learned that day was that you need to build up your mileage gradually. There is a rule of thumb I was unaware of that says your should increase your mileage by no more than 10 percent per week. After I recovered from the Turkey Trot fiasco I went back to running with a new approach. I ran easy and followed the 10 percent per week rule. From 2008 through the summer of 2016 my training consisted of running and nothing but running. I did learn there are different types of workouts, such as easy runs, speed drills, hill training, and long runs. I learned to do them in the right proportion within a proper schedule. I have to say it worked pretty well for me, all things considered. 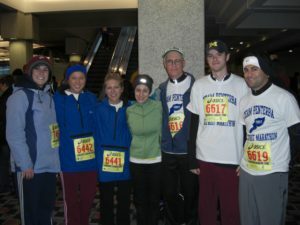 During that time I ran two marathons, a 30K, fourteen half marathons, two ten mile races, six 10K’s, and fifteen 5K’s. The highlights were the Saline, Michigan Summerfest 5K in 2009 which I ran in 23:56, and the 2013 Big Hit Half Marathon in Louisville, Kentucky where I finished in the top 21 percent of all runners with a time of 1:50:54. All the while I kept reading and hearing from other runners that strength training was a critical aspect of successful running. I had done a little weight lifting in my younger years and found it too boring to stick with for any length of time. And since I had become a pretty good runner without it I figured I didn’t need it. Until 2016. Last year was supposed to be the year I ran the Chicago Marathon. I turned sixty in June, and it seemed like a good idea to run the Marathon in the city of my birth to mark the occasion. (I was actually born in Evanston, but that’s close enough.) My winter training was interrupted by a series of medical issues that kept me from running for over two months. When I started running again I found it very hard to get my fitness back. I gave up my plan to run Chicago that fall. In July I decided to give this strength training thing a try. 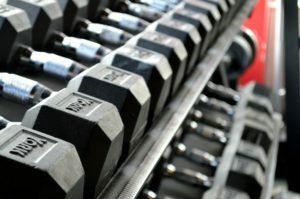 Starting out with very light dumbbells (to light to mention without being embarrassed) I developed a weight lifting routine and stuck to it faithfully. It has been a year and I’ve steadily increased the weight. A strange thing has happened. When I began my base training for Chicago in April my running started out strong and improved more quickly that I thought possible. At age 61 I am running stronger and faster that I have in several years. Could it be that the strength training that I had avoided for so many years is making me a better runner? I’m pretty sure it is.